Do you think you might want to try your hand at keeping a pet reptile? There are several things to take into consideration before you bring your new scaly friend home! How much room do you have to house a reptile? Some species can be kept in a cage the size of a 10 gallon fish tank, while others may require an entire room. Tiny reptiles include dwarf geckos and lizards such as anoles, day geckos, and curly tails. Snakes such as DeKay’s, ring-necked, ribbon, and green snakes also fall into this category, as do many more. Most of these animals can be housed in enclosures ranging in size from a 10 gallon to 20 gallon glass tank, or similar-sized cage. Small reptiles include leopard and fat-tail geckos, most colubrid snakes including king, milk, garter, and corn snakes, childrens pythons, sand boas, grandis day geckos, crested geckos, and carpet chameleons, just to name a few. Reptiles of this size can be housed in 20 to 30 gallon tanks or similar-sized enclosures. Breeding groups of some species may require more space. Medium reptiles include bearded dragons, water dragons, frilled lizards, uromastyx, ball pythons, rainbow boas, small island forms of Boa constrictor, large rats snakes, painted turtles, and mediterranean tortoises, among others. Animals in this size range often require 50 gallon to 100 gallon tanks or similar-sized cages, or 3ft by 4ft enclosures. Large reptiles include giant green iguanas, savannah monitors, blood pythons, some boa constrictors, leopard tortoises, red-eared sliders, and similar animals. These animals need large enclosures, or ponds, measuring over 6 ft by 4 ft in some cases. Giant reptiles include large monitor lizards such as Nile and Water monitors, giant constrictors such as Burmese and Reticulated pythons, the largest subspecies of boa constrictor, spur-thighed tortoises, alligator snapping turtles, and crocodilians. These animals need very large enclosures – in some cases, entire rooms set up just for them. Whether you have successfully kept reptiles before, and which species you have kept, will have a lot to do with choosing which species is best for you now. Are you a new reptile keeper? If so, you definitely do not want to start out with a giant reptile, or with a species that is difficult to care for, nor with a species that lives for a very, very long time. Some good choices for beginners include tiny lizards such as green anoles, house geckos, and dwarf geckos that live for 5 to 10 years, small reptiles such as leopard geckos and garter, and corn snakes that live for 15 to 30 years, and medium-sized reptiles such as ball pythons and that live for 15 to 30 years. Have you kept reptiles successfully in the past, and are ready for something more difficult? Consider species such as day geckos, crested geckos, bearded dragons, mediterranean tortoises, rainbow boas, or uromastyx. Are you an experienced reptile keeper who has kept reptiles for many years, and you feel you’re ready for a real challenge? Chameleons and giant reptiles are among the most challenging animals to keep, for various reasons. Some species require more commitment of time and labor than others do. If you have very little time to care for a pet, then a python or boa could be the right choice for you. Most species of pythons and boas spend the majority of their time hiding or resting. Due to their low metabolic rate, they eat once every week to 10 days, or even only once every 2 or 3 weeks for a few species, once they are fully grown. Since they eat just once a week, this also means they defecate once a week – so you may only have to clean the cage 2 or 3 times per week to remove urates and feces, and disinfected once a month. Providing clean, fresh water is your only other task. You can leave a ball python with a clean full bowl of water and a clean cage, and go away on vacation for a weekend without needing to have someone come to look after it. If you have a bit more time, then consider a small lizard, or a garter snake. Most lizards need to be fed only every other day. They do eat live insects, which have to fed good food themselves, and then be dusted with calcium. Crested geckos can be fed a commercial diet exclusively. Some lizards require a daily misting of water, though automatic misting systems are available. Most small lizard and garter snake cages will need to be spot-cleaned 3 or 4 times per week, and disinfected twice a month. Some tiny lizards can be kept in planted vivariums which, if set up properly with isopods and springtails in the soil, do not require more than occasional cleaning of the glass and plant leaves, and may only need to be thoroughly cleaned and broken down once a year. If you have plenty of time to care for a reptile, then you may consider an omnivorous or herbivorous species, such as a blue-tongued skink, bearded dragon, uromastyx, or tortoise. Some chameleons also fall into this category. If you can devote huge amounts of time and labor to reptile care, then you may consider some of the most high-maintenance types of reptiles, including water turtles, water dragons, crocodilians, and many chameleons. These animals may be very messy, requiring frequent changes of cage bedding and water – or they may have special requirements such as daily spraying of the eyes for some chameleons, and weekly showers in the bathtub. Keeping these species will keep you busy, but many people feel they are worth it! Reptiles do not like to be handled, but some species can learn to tolerate it, and a few may even learn to look to humans for food, and seek them out. If you really want an animal you can hold that will seek attention: Bearded dragons, uromastyx, tortoises, and some other herbivorous and omnivorous species are well known for learning that humans bring good food. These species may come to you for a handout, and become extremely comfortable with handling. If you want an animal that will be fine with handling, but don’t mind if it doesn’t come to you: Ball pythons, corn snakes, leopard geckos, red-eared sliders, and boa constrictors are examples of species that are generally docile and calm, and will eat from an owner’s hand and tolerate quite a bit of handling. If you want an animal that can be held occasionally, but don’t mind if you can’t handle it often: Rainbow boas and water dragons are a couple examples of species that you need to take time to tame, and won’t overly appreciate much handling. If you want an animal that you can handle in a pinch, but do not plan to touch it unless necessary: Tiny lizards can become tame and eat from your hands or from forceps, but are too fragile to handle often. 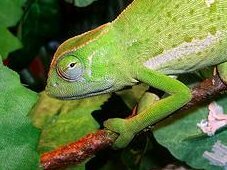 Chameleons also cannot be handled extensively, due to their sensitivity to stress. Green tree pythons can be aggressive, and will often try to bite. Decide if you are willing to deal with aggressive species, or simply species that are best looked at rather than touched. If you want an animal that you really cannot handle, but is there just to look at: The most aggressive animals fall into this category. Crocodilians should not be handled. Crocodile monitors, many Nile monitors, and some tiny dwarf geckos which are too delicate to handle directly are all examples of reptiles that can only be moved through indirect handling – hooks, catch-poles, cages, or a deli cup, depending on the size and reason. These species are strictly hands-off. The cost of the equipment needed to maintain your pet should be the first thing you determine when you’re considering purchasing a pet reptile. Some species with high price tags are fairly inexpensive to keep, while other species with very low price tags can be VERY expensive to care for properly. Snakes are the least expensive reptiles to keep, followed by lizards and tortoises, then turtles, then crocodilians. There are some exceptions, but this is a general rule. Expect to spend at least $100 minimum to outfit ANY reptile. Expenses can go up from there. Prices for actual animals can range from $5 for a green anole, all the way up to $20,000 for a prize ball python color mutation. The more difficult species are definitely not necessarily the most expensive. Are you going off to college in 2 years? Are you new to reptiles, and unsure if they’re right for you? Do you really love them and want a pet that will be with you forever? Reptiles with short lifespans include tiny lizards and chameleons. These animals tend to live for less than 10 years. These are a great choice for teenagers and for adults who are new to reptiles, and don’t want a huge commitment yet. Keep in mind that there really are no reptiles with a lifespan less than 5 years. Reptiles with more modest lifespans of 30 years or so include leopard geckos, corn snakes, and ball pythons. The biggest commitment of course comes with tortoises, which may live longer than human beings do, and must be put in your will! When you consider what species of reptile you want to keep, rate it using all of the above factors, so that you can choose a reptile that best fits in with your lifestyle and home!